Please read the following Terms and Conditions before requesting your new blog design. The following Terms and Conditions apply to all designs created under the name VK DESIGN COMPANY. By entering VK DESIGN COMPANY'S Design Line, you agree to these Terms and Conditions. The Design Process begins when VK DESIGN COMPANY starts creating the FIRST design for a client. VK DESIGN COMPANY reserves the right to decide what item is created first (i.e. banner, background, signature, etc.). Once one or more items are created (or far enough along to be deemed "created"), VK DESIGN COMPANY will upload the design(s) onto a test blog for the client. VK DESIGN COMPANY will contact the client with the test blog url when the first design(s) are uploaded. It is requested that the client respond with feedback on the uploaded design(s) within 48 hours. The quicker the responses, the quicker the Design Process. All designs in the Design Process are subject to the Custom Design Policy. All design sold as "Premade" are sold as-is with only the tweaks expressed in the Premade Design's description (i.e. title change for Premade Banners, etc.) included. Any other changes/tweaks/additions will be charged at regular price. VK DESIGN COMPANY reserves the right to determine what changes are deemed "included". It is important and extremely helpful for the client to express his/her desires for his/her new designs BEFORE the Design Process begins. Colors, images, style, layout, and design items should be chosen in advance. VK DESIGN COMPANY is happy to assist the client in choosing elements for the design, but will not "try out" several different designs before committing to a final design. If the client expresses a clear design plan (by way of explanation, drawing, sending of links or images, etc. ), the design will be created as accurately as possible. Should the client choose to accept the "created" design(s) he/she may opt to have new designs created (which are subject to the same policy) or choose to exit the Design Process with VK DESIGN COMPANY. VK DESIGN COMPANY reserves the right to re-sell any "rejected" designs without permission from the original client who rejected the design. All pricing is subject to change at any time without notice. A spot on the Design Line does not guarantee any pricing. Design prices posted on the Pricing Page of the VK DESIGN COMPANY website include the creation of the design item and NOT any image(s) that need to be purchased for the design from a stock image site (such as istockphoto.com). The cost of any image(s) that need to be purchased for a design will be added to the client's total. VK DESIGN COMPANY will not purchase any images without expressed consent by the client. *For instance, should Blogger stop accepting sidebar title images for the Profile Gadget, a client who previously purchased a sidebar title image for his/her Profile Gadget will not be refunded the cost of the item. Should the client choose to add extra elements to his/her design(s) after the design(s) have been installed, he/she might not need to wait in the Design Line for such additions. See the "Squeeze-You-In" Policy for details. Prospective clients who contact VK DESIGN COMPANY with design requests are placed on the Design Line in the order they contacted VK DESIGN COMPANY. A list of the Design Line can be seen at design-line.vkdesigncompany.com Some design requests do not require that the client wait in line. For a list of exceptions, see the "Squeeze-You-In" Policy. Some design requests do not require that the client wait in the Design Line. These requests include (but are not limited to): *Small additions/tweaks to a current design (including, but not limited to: blog signature, sidebar title images, watermark, etc.). *Print items to coordinate with existing design (i.e. mugs, totebags, business cards, etc.) *Small individual items for new clients, such as: blog signature, Favicon, etc. 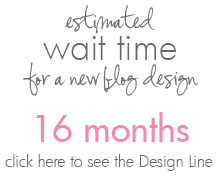 VK DESIGN COMPANY reserves the right to decide if it is necessary for a client to wait in the Design Line. To request your new Blog Design, please fill out the following form. **If you do not receive a personal response from me within 3 business days, please send an email to veronica@vkdesigncompany.com.